Anna Ragsdale Camp (lahir di Aiken, South Carolina, Amerika Serikat, 27 September 1982; umur 36 tahun) merupakan aktris televisi asal Amerika Serikat. Dia dikenal karena perannya sebagai Sarah Newlin di musim kedua dan keenam dari serial True Blood. Dia memiliki peran berulang di musim keempat Mad Men (2010) dan musim ketiga dari seri drama hukum CBS The Good Wife (2011-2012), serta peran pendukung dalam The Help (2011) dan Pitch Perfect (2012). Just Make Believe Kristin Short film. 2009 8 Easy Steps Laura Short film. 2013 Sequin Raze Jessica Short film. 2001 Roswell Stripper Episode: "To Have and to Hold"
2007 Reinventing the Wheelers Meg Wheeler Unaired pilot. 2008 Cashmere Mafia Brooke Adaire Episode: "Pilot"
Glee Candace Dystra Episode: "Sectionals"
Covert Affairs Ashley Briggs Episode: "Houses of the Holy"
– "The Chrysanthemum and the Sword"
2011–12 Love Bites Prudence Episode: "Stand and Deliver"
The Good Wife Caitlin d'Arcy Recurring role, 8 episodes. 2011 I Hate That I Love You Sarah Television movie. – "Two of a Kind"
2009–13 True Blood Sarah Newlin Series regular, 16 episodes. 2013 Super Fun Night Felicity Episode: "Pilot: Multi-Camera Version"
2013 How I Met Your Mother Cassie 2 Episodes: "Knight Vision", "The Lighthouse"
13 The Mindy Project Gwen Grandy Series regular; 14 episodes. 2013 Ground Floor Heather Episode: "Woman On Top"
^ ASTROLOGICAL FORECAST|September 27, 2012. The Chronicle Herald. September 27, 2012; retrieved October 2, 2012. ^ Hernandez, Ernio (September 17, 2008). "PLAYBILL.COM'S CUE & A: Anna Camp". Playbill.com. Diarsipkan dari versi asli tanggal September 16, 2010. Diakses tanggal August 9, 2010. 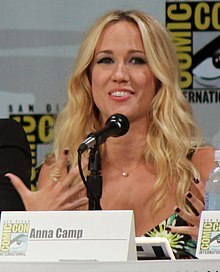 ^ a b "Anna Camp Awards". Who's Dated Who. Diakses tanggal April 14, 2013. Halaman ini terakhir diubah pada 8 Mei 2016, pukul 13.52.